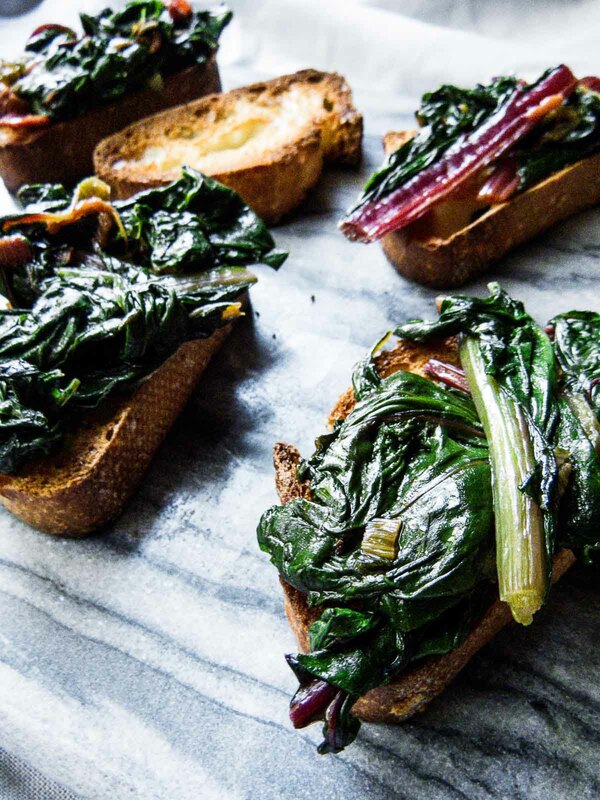 Nothing can get better than grilled or toasted bread topped with garden fresh garlicky Swiss chard. 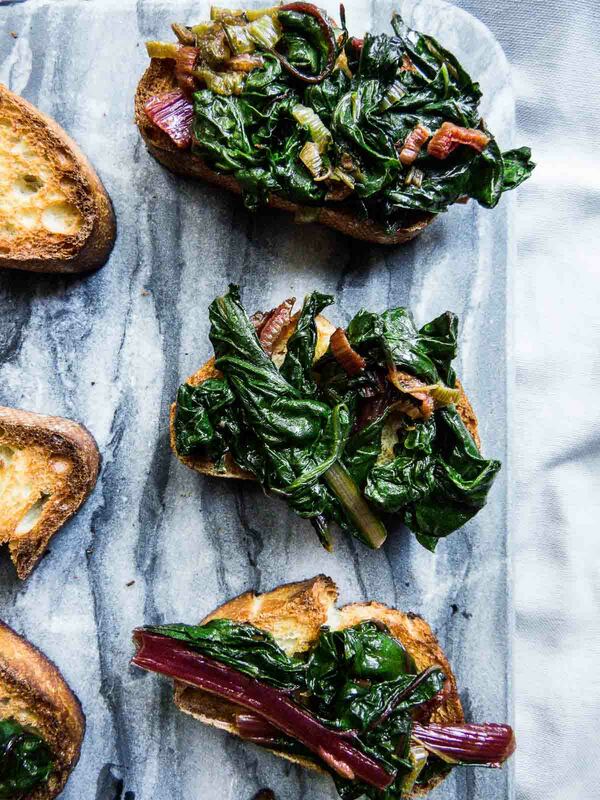 As an appetizer, savory snack or side, Garlicky Swiss Chard Bruschetta will be an easy and impressive addition to any menu! So I’ve been playing around lately. Instead of my typical sautéed rapini I’ve been experimenting with other sautéed greens – like spinach toasts I talk about in my White Mountains post. But instead of creating a recipe post with spinach, a widely used leafy green, I thought I would explore the use of another, lesser used but still amazing green, Swiss chard. Swiss chard is a slightly bitter green that can be eaten raw or cooked, and is packed with good stuff like vitamin K and vitamin A. Like spinach or escarole, it can be put in salads, soups and of course Garlicky Swiss Chard Bruschetta. When cooked, it drastically reduces in size and may become slightly more bitter. From my side hustle learning about food, salting as you cook is not just for making a dish salty. In fact, salting through cooking is a great way to reduce bitterness. When buying Swiss chard, look for large crisp leaves with firm celery-like stalks. It also comes in several different varieties, which are usually available at grocery stores and farmers markets. My chard comes from my mom’s garden. She grows Swiss chard that has red, white and orange stems. So far we have harvested from our plants 2-3 times! And if you follow me on Instagram, you have seen me make this recipe in the stories when it was under development. Although a simple recipe, it did take some development: how to use the garlic?! Garlic, like onions, shallots and other alliums, has sulphur-containing compounds, which the plant uses as a defense against insects and animals. Consequently, these compounds are why we use garlic in many dishes – super delicious! However, the more we cut into the garlic: whole vs. crushed vs. chopped vs. minced, the more these sulphur-containing compounds are exposed to air (i.e. oxygen) and the more pungent the flavour of the garlic will be. Yes, in this recipe I wanted yummy garlic flavour to infuse through the Swiss chard, but I also didn’t want it to be too pungent. In my experience (and testing) crushing the garlic and frying it in the oil before sautéing the Swiss chard is best. When using minced the garlic flavour can over power the chard (depending on the strength of the garlic itself) and depending how thick you slice the stems, can start to burn if cooking in the oil too long. Besides sautéing Swiss chard like rapini: in oil with flavouring like garlic, chilli flakes, lemon juice, etc. the leaves can be tossed in a salad and it is also a great additions to pasta and eggs. When cooking Swiss chard with the stems I like harvesting from multiple plants to have a variety of stalk colours. If you don’t grow your own, grocery stores usually carry rainbow Swiss chard bunches when it is in season. Also, I would love to try and use Swiss chard as a shell for wraps in replacement for tortillas or pitas – there are tones of recipes out there for collard green wraps and I’ve really wanted to try this type of replacement. Unfortunately, collard greens are not always available at grocery stores close to me, or come in huge bunches! Of course, if I were to try this with Swiss chard, I’d need nice crispy sturdy leaves! Anyhow! Whether you’re enjoying time camping, at a cottage campfire or need to eat up harvested Swiss chard, this recipe is great appetizer/snack before dinner and is sure to please guests! Especially those who don’t know about Swiss chard! Also, some would say to blanch the Swiss card before sautéing it. I find that this step can be removed, prep your Swiss chard by washing it but not drying it. The water that remains on the leaves is just enough to steam the leaves a bit when you throw them in the skillet! 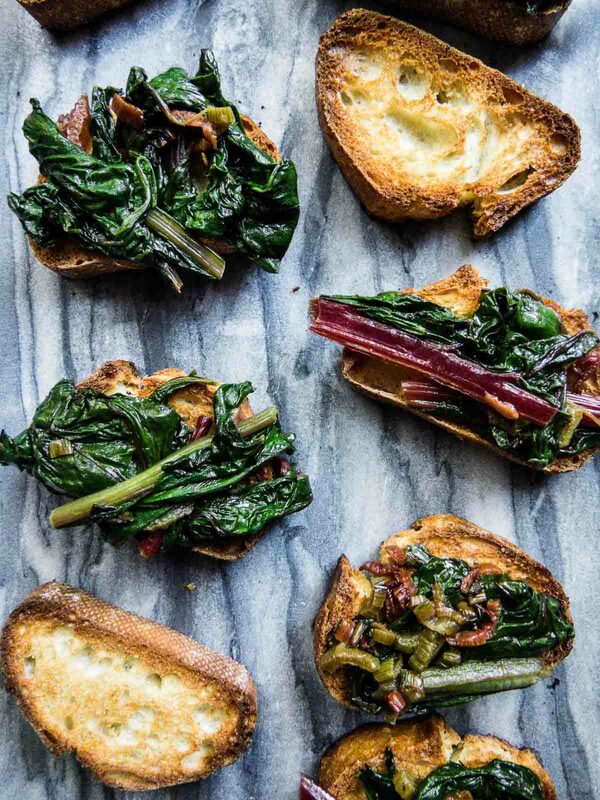 Nothing can get better than grilled or toasted bread topped with garden fresh garlicky Swiss chard. 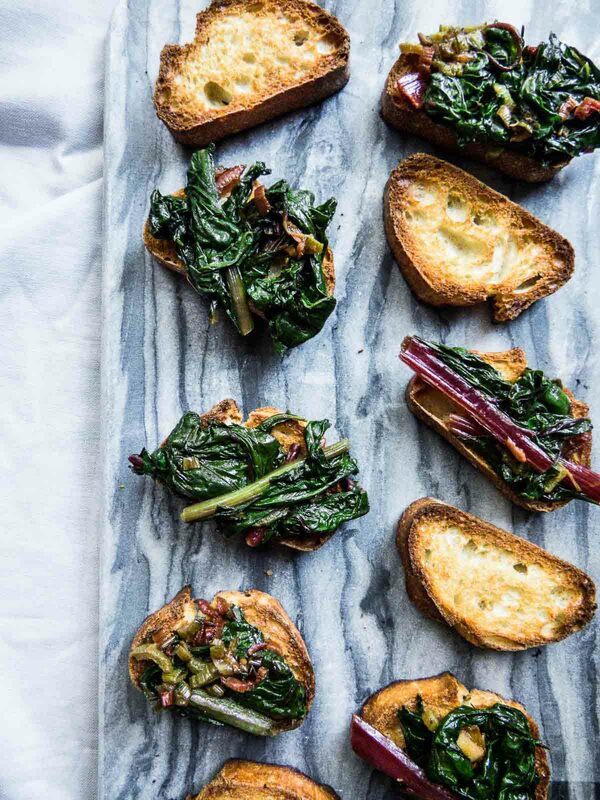 As an appetizer, savoury snack or side, Garlicky Swiss Chard Bruschetta will be an easy and impressive addition to any menu! Wash Swiss chard. Remove and thinly slice the stems, and roughly chop the leaves. In a large skillet, heat oil over medium and add garlic. Let the garlic fry for about 1 minute to let it flavour the oil. Add the stems and sauté until tender, about 8 minutes. Remove the garlic pieces. During that time, slice the bread and either toast in a toaster or under the broiler or grill on the BBQ or a grill skillet. Next add the leaves to the stalks and sauté until nicely wilted, about 5 minutes. 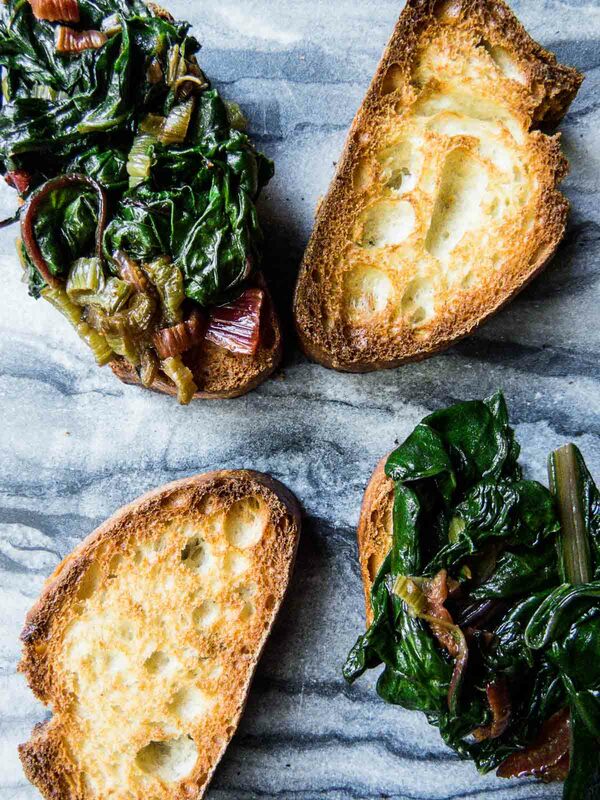 Top the grilled or toasted bread with the garlicky Swiss chard mixture and serve.